Kate Humble presents the stone curlew. Kate Humble presents the stone curlew. Stone curlews belong to a family known as 'thick-knees' but their country name of 'goggle-eyed plover' suits them better. Their huge staring yellow eyes serve them well at night when they're most active. By day, they lie up on sparse grassland or heath where their streaky brown-and-white plumage camouflages them superbly. 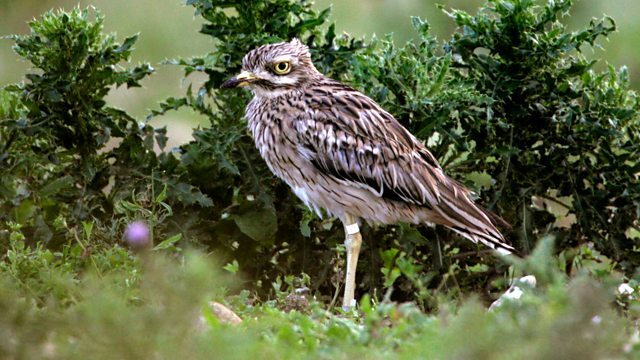 This programmes contains audio archive of a stone curlew that was sourced through the RSPB. The original recording is not available online to listen to.